All daily drawings of the sunspot groups and USSPS produced by INAF - Catania Astrophysical Observatory are available in this page. When the weather conditions permit, daily drawings of sunspot groups and pores are maken by a Cooke refractor (150mm/2230 mm) on a 24.5 cm diameter projected image of the Sun. 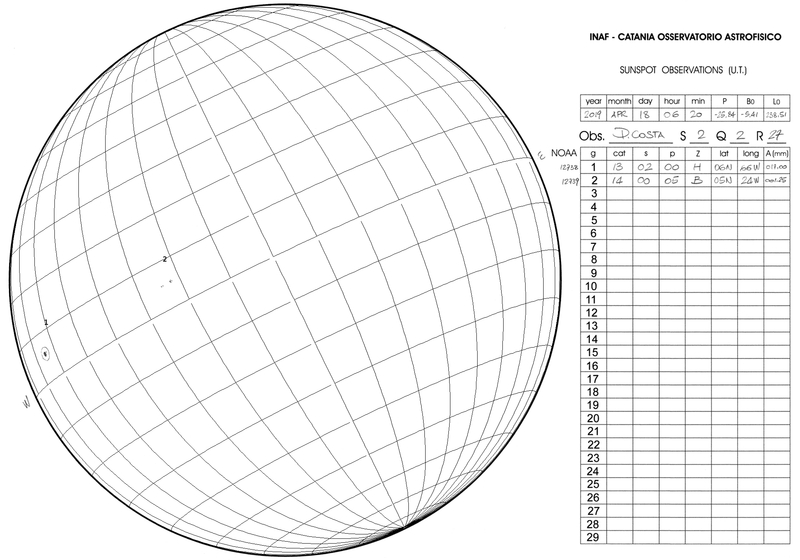 These drawings are used to determine some charcteristics of the SunSPotS groups visible on the photosphere and to report them in form of a numerical code (ursigram), named USSPS. On the right side it is shown the corresponding drawing in jpeg2000 format. Click on the image for a larger display. The latest USSPS from Catania in a .txt format can be also downloaded clicking on "download".